I try not to bake cookies too often because when I do, I end up eating way too many. I think everyone can understand how that one works. So when I do heat up the oven, and get my stand mixer out I like to make things for other people. Often I like to make little cookies that I can put in cute little boxes, tie with a piece of ribbon and make someone’s day. I love getting and giving baked goods as thank you gifts because to me, nothing shows a little love like some freshly baked cookies. These little guys are the ideal thank you cookie, a cream cheese cookie with swirls of chocolate. Hello heaven! Plus they are little so they’re easy to package and they are unlikely to break whilst delivering them. The best thing about this recipe is not only are these very quick and easy to make, this recipe makes a bunch. We’re talking 4 dozen, and they don’t spread so you can cram into the baking sheets. Usually here on the blog, I love to make up my own creations to share with you all, but sometimes there’s a recipe that is just so good that I must share it – this is one of those. In a large bowl, using a hand mixer, or stand mixer fitted with the paddle attachment, beat sugars, margarine, cream cheese, egg and vanilla until light and fluffy. Add flour, baking powder and salt. Mix at medium-low speed, until combined. Fold in the melted chocolate, until the dough because slightly marbled. Drop dough on a greased or parchment lined cookie sheet using a teaspoon or cookie scoop. Baked for 10-12 minutes, or until edges are slightly golden, let cool and serve. 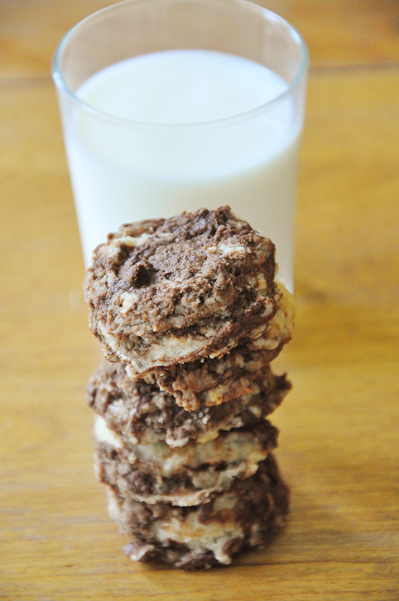 Enjoy these chocolate swirl cookies, happy Monday! these cookies are TO DIE FOR! I can't stop making them! Still my favourite recipe on this blog.